Decorate using blue and white, colors of the Greek flag. Hosting a Greek New Years Eve party can be a great way to ring in the next year, regardless of personal heritage. In Greece, the New Year is considered a national holiday and is referred to as Protohronia. New Year's Day, January 1, is celebrated as Saint Basil's Day, in honor of a saint in the Greek Orthodox Church who gave to the poor. Traditionally, gifts are exchanged and games are played during the day. One of the most recognizable symbols of the holiday is the New Year baby, who often wears a top hat, sash and diaper. Though the material items were added years later, the baby actually came to embody the upcoming year because of ancient Greek tradition. The Greeks would place a baby in a basket to symbolize Dionysus, the god of wine. According to lore, he was reborn at the New Year as the spirit of fertility. 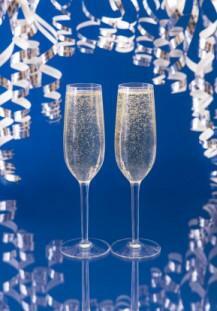 Planning a New Year's Eve party requires plenty of activities to keep both adults and kids busy. Fireworks at midnight are a tradition in many regions of the world for New Year's, including cities in Greece. Pick up some sparklers and let both kids and adults celebrate with a scaled-down version of the big show in the backyard. Children will stay awake until the clock strikes midnight if they keep busy playing some traditional and modern Greek folk games, like Berlina and Vasilias. Rules of play for a number of Greek games can be found online at Children's FOLK GAMES from the iEARN Multicultural Project. Kids might also enjoy singing New Year songs called Kalandas, or Greek carols, as part of a New Year's Eve party. The Music Library of Greece "Lilian Voudouri" offers a downloadable New Year's Kalanda, sung in Greek. Traditionally, Kalandas are sung as children move from house to house. After the carols, they are given treats or gifts of money. If children are not familiar with the Greek language, use Kalandas for a game of musical chairs or for some dancing. Adults often play card games or games of chance on New Year's Day, so make that part of the evening's entertainment. A tournament could even be set up, depending on the number of players involved. Possible Greek card games include Pilotta and Biriba. Foods can be served as a New Year's party buffet or in a sit-down, family-style dinner. Choose what works best with the space and amount of people invited to the party. At midnight, serve a traditional Vaselopita. This Greek New Year's Eve party cake is heavy and contains a small coin. The person served the piece with the coin is said to have good luck for the entire year. No celebration would be complete without proper party decorations. Create a sleek theme by using the blue and white of the Greek flag. Pick up streamers, confetti, disposable utensils and plates and hats in those colors. A New Year's Eve party with a Greek theme can be decorated to look like ancient Greece from the mythological tales. Add plastic or paper columns, which represent the ancient ruins, around the room for guests to place their drinks on. Grapevine and ivy garlands can be woven around doorways and staircase banisters. Pick up some fun New Years party hats that are actually laurel wreaths. A scene setter with a snow-covered mountain could be used to represent Mount Olympus. World travelers who have visited places like Athens, Greece may find that using souvenirs and photos is the best way to decorate for their Greek themed party. Blowing up several scenic photos using a printer and 11 x 14 paper is a great way to get a large mural at a low cost. Hang any fabrics or clothing that was purchased while visiting, and set out books and artwork. A New Year's party often has food, drinks and activities for young and old. Put a novel spin on tradition by hosting a Greek-themed party, complete with food, games and décor that were inspired by the country and its people.